When the Temple was completed in 2003, the altar at the front was simple. Here's a picture from 2005. Notice that only a few items have been added. Over the years, many people put items on the altar. Here's a picture of the altar a few years later. Early in May of 2010, volunteers painted the inside of The Temple. As part of this process, all items on the altar were removed. When the painting was completed, I recreated the altar. 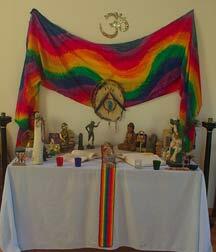 After placing a blue cloth over the altar table, I put a rainbow-colored ribbon down the center, front to back. On it I put stones and crystals symbolizing earth. On each side I positioned statues and objects symbolizing various religious and spiritual traditions. On the right and left sides I placed bowls or bowl-like objects, forming a container for the truth of the altar. 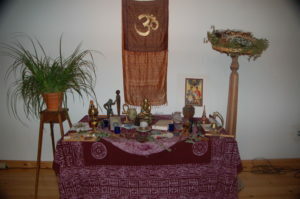 Above the altar I hung a rainbow-colored fabric and the Sanskrit symbol for Om. At the front of the altar I placed a row of candles , symbolizing the light that comes to us as we contemplate spiritual truth. Inside the arc of statues I put two books symbolizing all written religious traditions – a Koran and a Roman Catholic missal. I avoided anything in the center that would create a bias toward one tradition, but the altar didn’t seem complete. Then my eye fell upon a Native American medicine shield that had never before been part of the altar. Placing it on the wall below the Om made the altar complete. The shield represents the the interaction of earth spirituality – the crystals – with the divine force of creation – the Om. The figurines and books on either side represent the manifest traditions that have evolved from the first earth-centered faiths. Since 2010, the altar has been changed many times. That’s okay. My hope its that changes are always made from a connection to Spirit and inner truth.